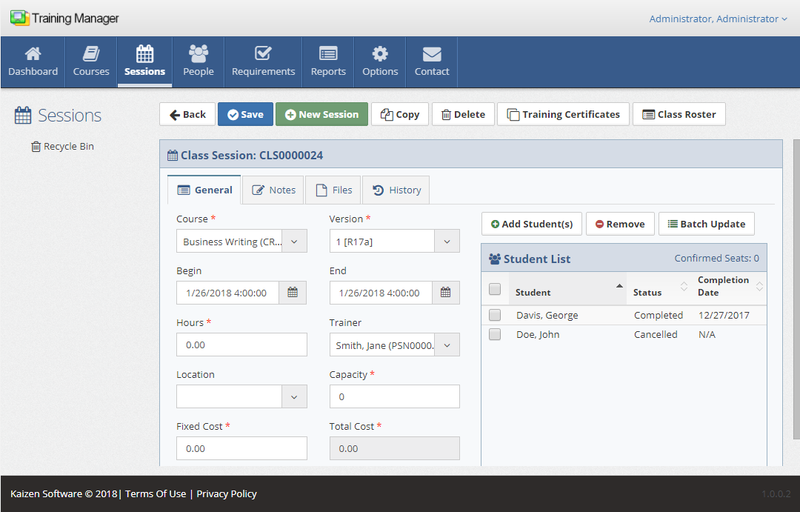 Web-based Employee Training Records Management for your business. Managing company training records is becoming increasingly important for Regulatory, HR, and Safety compliance tracking, as well as for ensuring quality with consistent operational performance. Many of our customers started out tracking their training records in file cabinets, spreadsheets, or custom-built systems, but as the volume of their training records increased, it became cumbersome and error prone to manage the training and re-training requirements as personnel moved between groups and job roles. Training Manager Web Edition solves these problems, and since it runs in a fully managed cloud, you can begin using it immediately and avoid a long implementation project. 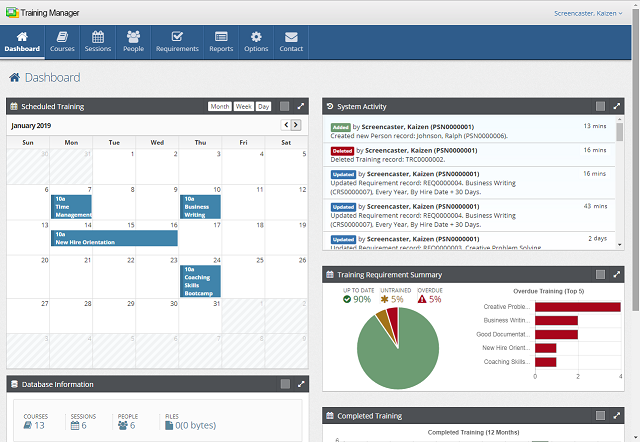 Report on training status and easily identify training gaps and training due to expire soon. Manage requirements company-wide, by group, job role, or individually. Track attendance, cancellations, no shows, etc. Record training credits, training hours, and assessment scores. Print transcripts, training plans, compliance reports, and more. Track training costs by Group, Individual, Course, Category, or Supervisor. Automatically track all changes in an Audit Trail. Since this Employee Training Records Management Software is web-based, there's nothing for you to install or maintain. You can get a free account to try it out and begin managing your training records today. See overall training status showing the percentage of Overdue, Untrained, and Up To Date required training, Scheduled class sessions in the calendar, recent updates, and current database statistics. Schedule training sessions, print training certificates, class rosters, add/remove students, batch update, and more. 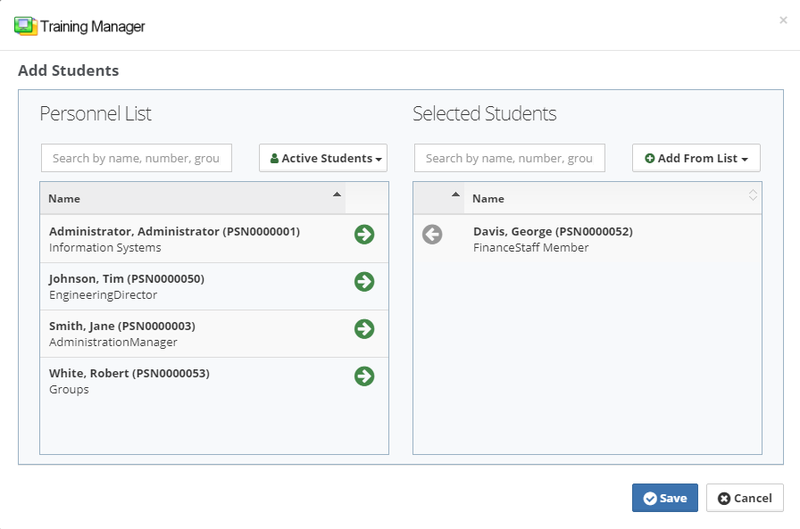 Easily add multiple Students to a class session record. Filter the list or add from pre-defined lists based on training requirements. 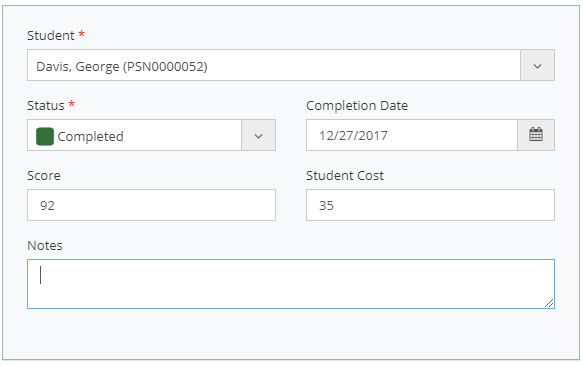 Update individual training records within a class session to track the Student, Training Status, Completion Date, and optionally the Score, Cost, and Notes.